We are not about ‘beautiful’ and ‘pampering’, although you will certainly feel both after visiting us, we are about education and results! All of our carefully selected products and services are chosen to promote skin and body health and achieve results you can see and feel. All of this in a welcoming, luxurious and professional environment……..perfect! Our friend referral scheme lets us say thank you for recommending your friends to us. Each friend you refer will receive 25% off of their first service….once they have visited us and received their discount, you will then be able to have 25% off of your next service! There are no limits to this one so the more of your friends that visit us, the more discounts you can use! Re-booking discounts; re-book your next appointment before you leave the salon and a long as you don’t need to change it or cancel it you will receive 10% off that service next time! After qualifying in 1993, I have had the privilege of working in some of the best salons, spas and training establishments and with some of the most amazing therapists and trainers over an extensive career both in the UK and overseas. In addition to many years of experience as a therapist I have taught beauty therapy for many years. I have had roles with two of the leading awarding bodies within the beauty industry; previously as an International Examiner for CIBTAC and currently as an External Quality Assurer with VTCT, all of which reflects my passion for standards and quality in the industry. This wealth of experience has finally cumulated in the long held vision of Skin Spa. Before training as a beauty therapist I held managerial roles in large companies and looked after high profile guests in the Super Yacht industry. After taking a break to have my two lovely girls I decided to take the plunge and retrain in the beauty industry which I had always held a passion for. After qualifying as a beauty therapist I worked in a holistic based Spa with a focus on massage and alternative therapies. I gained excellent experience and knowledge here but was keen to be able to utilise all of my skills and take on new challenges. 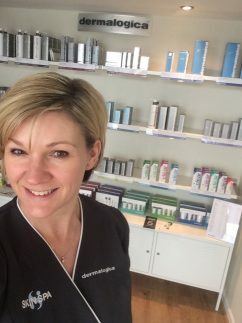 I became part of the Skin Spa team in 2018 and share the passion for delivering high standards of client care and quality treatments in a professional environment.